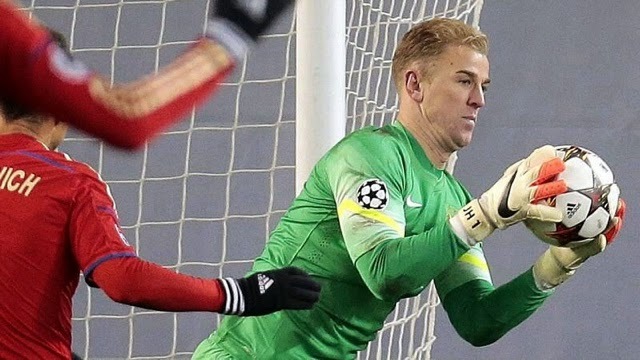 Joe Hart in action versus CSKA Moscow this week. Joe Hart will sign a new Manchester City contract today before the City vs West Ham matchup in the Barclays Premier League. Joe Hart's first season at Man City he was on a loan spell at Birmingham but in the 4 years at City he has made over 200 saves in the BPL and grabbed two Premier League titles, an FA Cup, a Capital one cup and a Community Shield. Joe Hart's career highlight has to be when he saved certain goals from Bayern Munich in the UEFA Champions League where City went out 3-2 winners in Munich. So how long and for how much money will Joe Hart get when he is s to sign his contract? Comment down below or tweet to @_TheSportMatrix on Twitter. Joe Hart Signs new City Contract.